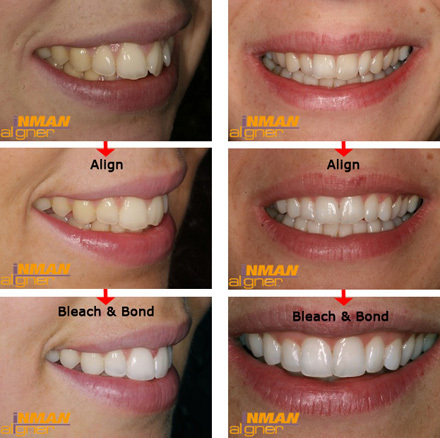 If you are in need of a swift, easy and minimally invasive smile makeover then look no further than the revolutionary Align, Bleach and Bond (ABB) procedure. This is guaranteed to dramatically transform your smile making it dazzle all those who see it. The best part is that you will keep as much of your natural tooth structure as possible because this treatment requires NO drilling and NO veneers. In order to get the same standard of results in times gone by, a patient would have to undergo tooth filing and then have veneers affixed. We disagree with removing any sections of healthy tooth structure so have opted for the inventive ABB method. The process is remarkably simple. We first make use of the Inman Aligner or modern, clear braces to straighten the teeth. Whilst this alignment is underway, we will simultaneously whiten the teeth saving you time. The final step is to craft a sublime smile shape by building the teeth up through sophisticated composite bonding.